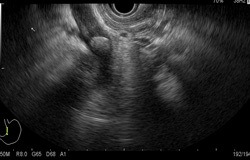 Endoscopic ultrasound (EUS) is an endoscopic procedure for imaging of the upper gastrointestinal tract (oesophagus, stomach, and duodenum), and the pancreas to biliary system (bile ducts, gallbladder, and pancreas) using a flexible endoscope equipped with a small specialized ultrasound probe. 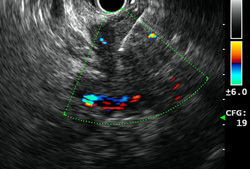 What are the reasons for undergoing an endoscopic ultrasound? An endoscopic ultrasound may be recommended to patients who have or are suspected to have pancreatic disease in the pancreas or bile duct and can be both a diagnostic and therapeutic procedure. Usually an endoscopic ultrasound is recommended after abnormal test results or a patient experiences worrying abdominal pain symptoms thought to be related to the pancreas or bile duct. How does an endoscopic ultrasound work? Before undergoing EUS, patients are given sedation. A thin tube is inserted through the patient’s mouth and led down into the stomach. Once in the stomach, a small ultrasound probe at the tip of the tube emits soundwaves which produces a clear image of the desired area (such as the pancreas, digestive tract, or stomach). If masses or other signs of disease are found, a small biopsy will be taken for testing (with by EUS guided Fine Needle Aspiration (FNA). Depending on the disease condition being evaluated, the duration of an endoscopic ultrasound examination usually lasts from 20 to 40 minutes. Preparing for your endoscopic ultrasound. A patient is asked to avoid eating and drinking for 8 hours before the procedure. Some medication should also be avoided prior to your appointment, so make sure to discuss this with your doctor. Following the procedure, it is advised that a family member or close friend should drive you home, that you avoid driving heavy machinery and signing important documents. What are the risks of an endoscopic ultrasound? EUS is generally considered a safe procedure when performed by an expert health team. However, like most medical procedures it carries a small risk of complications. How much does EUS cost? The cost of the procedure depends on whether one or more samples need to be taken for testing, or if it is simply an imaging procedure. Please contact our staff at 3505 4316 for further details. Also feel free to check out our homepage for other bowel-related queries.